Moving from San Francisco to the Main Line was a big step for me, but what was even more challenging was getting used to the traditional design aesthetic of the area. The Philadelphia Main Line is rich with tradition, stemming from country estates that were homes to Philadelphia’s wealthiest families in the 19th Century. The homes in the area have a very distinctive style and the residents have very distinctive taste. (Think tweeds, plaids, Scalamandre and Ralph Lauren). I must admit, I had a very difficult time getting used to this. When I first moved to the Main Line (17 years ago) my taste was extremely modern. When I designed my first kitchen, I couldn’t even imagine having a raised panel on a kitchen cabinet, and placing one on a refrigerator was like the ultimate sin! How could people hide the beauty of stainless steel? The thought of intricate crown molding or fancy wainscoting made me cringe. An ogee edge on a countertop was scoffed upon. I would get into countless debates with my husband (who’s a custom home builder and from the area) regarding the details of what we were going to build and his argument was that the resale value of our home would be terrible if we built a super modern home. Not many from the main line appreciated modern design at the time and so I was forced to change my design aesthetic. Change is good. 17 years later, as a main line interior designer in Devon, my taste has now evolved to appreciate detail on cabinetry, add intricate moldings and detailed wainscoting to my projects, and respect and appreciate the tradition and beauty of this culturally rich area. My design work has become the true definition of “Transitional Design” – living in the Main Line has taught me to mix the old with the new, fuse the modern with the traditional, and merge simplicity with sophistication. For the past 8 years I’ve been living in Devon, which is home to the Devon Horse Show, the nations oldest and largest horse competition in the US. 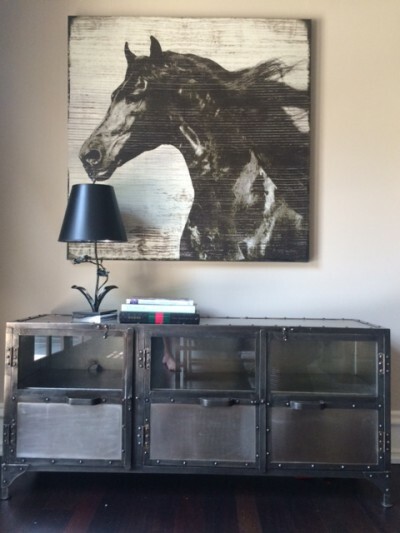 (Now I even have horse motifs in my own home)! I value the tradition of this area and feel it is important to reflect this in my design. It’s important to stay true to your environment and the beauty of interior design is that you can respect tradition while embracing new ideas.